Check the glass package before investing in replacement windows. Remember that this component plays an important role in your window’s thermal efficiency, which is why you need to prioritize it. Renewal by Andersen® of St. Louis, a premier home remodeling company in the area, discusses the important glass features to consider when choosing the perfect windows for your home. Glass coatings can help protect your interior furnishings from ultraviolet (UV) rays. At Renewal by Andersen, our glass has metal oxide coatings that help reduce water spotting by up to 99% when activated by sunlight. On the inside surface of the glass, we use spectrally selective multi-layer low-emissivity (Low-E) coating that has more layers than standard glass. This helps reduce undesirable solar heat gain that can affect your home’s comfort levels. Double-pane windows can also boost your home’s energy efficiency. There should be enough space between the two panes, however, to minimize heat transfer into your home or warm air from escaping from your interior. Fortunately, Renewal by Andersen optimizes the extra space between the glass panes for best thermal performance. The space between glass panes is often filled with inert gas to improve insulation. For instance, our company uses a specially formulated argon gas blend to help keep your home cozy. Window glass is prone to breakage. This is why you need to pick a glass package that can stand the test of time. Our team, for instance, stands by our High-Performance™ Low-E4® glass, which is backed by a 20-year limited warranty. 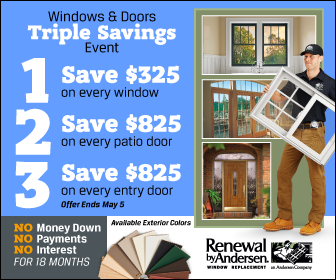 Renewal by Andersen of St. Louis provides professional installation of high-quality windows and doors to help minimize energy loss. Call us today at (314) 332-2364 to learn more about our products and services. We serve residents of St Louis and other nearby areas in Missouri.